It is slightly cumbersome to the development cycle to recompile PSI4 every time a change is made to the C++ code. It’s also daunting to new developers if they’re required to learn the structure of the source tree, executable initialization code, and makefile systems in the existing code in order to add new features, which was never a problem with Psi3 due to the independent nature of the modules. To overcome these problems, PSI4 now has a useful plugin feature. This allows codes to be developed as standalone entities, which are compiled independently of the Psi source, but can still link against Psi’s vast library. The plugins can be loaded at run-time from any location. 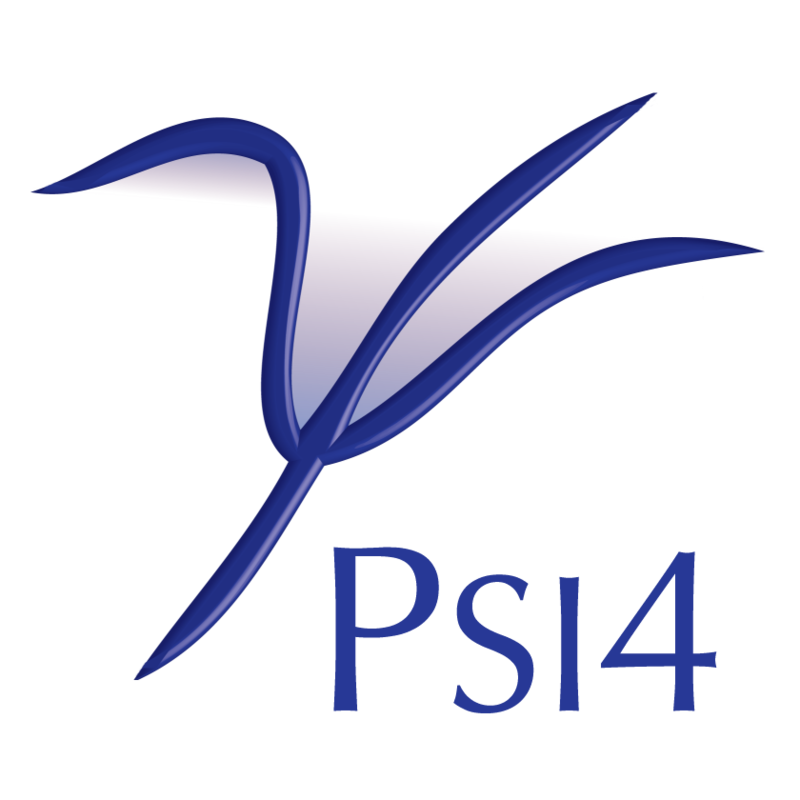 PSI4 can create basic plugins for you and automatically tailor them to your compilation environment. To create a basic plugin, run the following while replacing myplugin with the name of your great code. If the name you provide is not valid, PSI4 will complain. PSI4 will create a new directory with the name you specify for the plugin. In this example, a directory named myplugin will be created. All you need to do is cd into the directory, use PSI4 to generate a Makefile, and type make. Then execute psi4 in the directory on the default input file. PSI4 plugins can also be created using Conda for both PSI4 binary and development environment. On Linux (or Ubuntu shell on Windows), one can use the gcc compiler installed alongside psi4 itself in the Conda distribution or environment (below, $PSI4CONDA). On Mac, one must use libc++.so (not libstdc++.so), and this can be accomplished by installing XCode from the App Store that provides clang and clang++ compilers. Attention! This SCF may be density-fitted. Please note that the conda distribution must be in $PATH or the conda enviroment must be activated before compilation and execution of plugins created using this procedure. CMakeLists.txt — CMake file governing project plugin. The plugin source and CMakeLists.txt is independent of platform and PSI4 installation. You use CMake (version 3.1 or later) to generate a Makefile for the plugin by pointing it to a specific PSI4 installation. Run psi4 --plugin-compile to get a command to execute to generate the Makefile. What that command is doing is loading the compilers and options used to build the parent PSI4 (the -C psi4PluginCache part) which in turn can be overridden by passing -Doption=value commands to cmake and pointing toward a particular PSI4 (and probably pybind11) library to link against (the CMAKE_PREFIX_PATH part) and telling it to do an in-source build (the . part). Then just run make in your plugin directory. After any change to the plugin C++ code, make must be run in the plugin directory to recompile the myplugin.so executable, but recompiling the main PSI4 code is not necessary. Should you add additional (non-header) files to the plugin or need to link to additional external libraries, add that information here. input.dat — Sample input file for the plugin. Since the __init__.py file makes the plugin directory look like a Python module, the plugin can be treated as such in an input file. The location of the plugin directory must be included in PYTHONPATH, either externally in the calling shell or defined in the input file. This is usually done by manipulating PSIPATH. Then, the plugin can be loaded as import myplugin and executed as energy('myplugin'). Any other Python functions are also available from the input file, e.g. myplugin.testfunction(), note the namespace protection. pymodule.py — Python component of the plugin. By encoding the sequence of PSI4 module calls needed to run the plugin in the run_myplugin() function in this file, the plugin is hooked into the main PSI4 driver function energy() and so can be accessed through energy('myplugin') in an input file. Any other Python functions can also be placed in this file. __init__.py — Init script for the plugin (in the sense that the whole plugin directory is a Python module). This file generally won’t need editing unless additional Python files are added to the plugin directory (add additional lines to the # Load Python modules section) or the plugin depends on .so codes in other plugin directories (add additional plugin_load lines relative to the current plugin directory to the # Load C++ plugin section). doc.rst — Documentation file. Place in this file any notes, equations, warnings to users, todo lists, etc.. Plain text is fine, though reStructuredText is the ultimate goal. Remove the .. comment text and build Sphinx documentation for samples of linking keywords, sections, and math. This file is absorbed into the PSI4 documentation, along with any docstrings to Python functions, and the C++ keywords block in the myplugin.cc file. See Updating the Users’ and Programmers’ Manual for building documentation. Please note that pure virtual functions in a plugin may cause undefined symbols errors when the plugin is loaded. To create a purely Python plugin, create a new plugin directory, then remove the Makefile and myplugin.cc files and erase the shared object loading portion of __init__.py. Create as many .py files as necessary (registering each one in __init__.py), use input.dat as a model for loading the plugin, no recompile ever necessary.